Hi everyone – this is my last Blog for 2011, and so it’s a bit more reflective, and longer than usual. The final stage of the lengthy commissioning process for services to young people looks likely resulting in Surrey Youth Consortium being likely to win some, but not all, of the contracts available – see Cabinet report for 20 Dec. on our website. Surrey CC is moving to a commissioning process for voluntary sector support service bodies like the district/borough Councils for Voluntary Services (CVS) and Surrey Community Action (SCA) with effect from April 2013, and reducing grants to them all in 2012/13. My colleagues are also experiencing the imminent ending of a variety of government grants and in consequence SCA has just given 3 months notice of the likelihood of redundancy to a large group of staff. Whilst unavoidable now, it is a great pity that this is happening. My colleagues are pinning hopes of some offset by the prospect of a successful Transforming Local Infrastructure bid to the Lottery (£600,000 sought). Restructuring, mergers and, I fear, redundancies will be in evidence regardless of the success of the bid, but it’s tough on those likely to be losing their jobs in March. Happily our own core grant for next year is being maintained, though we are experiencing cuts elsewhere. A sub -group of Trustees met this week to consider the budget for next year, and whilst this will be a second year of deficit budget, our reserves are strong enough at present to see us through 2012/13. I am grateful for the trust and flexibility being exercised by Trustees. Fundraising is crucial for next year as it is for every other organisation, and we are preparing bids; the pity is that whilst we have to prioritise this, we can’t be delivering to our members so easily. However, we are progressing some things. Our “4X4” project links 4 member charities to 4 businesses, and we are now actively engaged with the Chamber of Commerce in “match- making” the first group at the end of January. On the governance front we are strengthening the Board of Trustees/ Directors and will shortly have an outstandingly able Board. We are bringing together (brokering) some key stakeholders interested in the redevelopment of a site in Epsom owned by Sanctuary Housing that will become a new build supported housing hostel for homeless young people. My perception is that there are two worrying issues amongst young people in Surrey : youth homelessness, and anxiety/depression. I am joining the Board of CAMHS so hopefully can contribute to the debate on the latter issue. My Chairman and I had a very good meeting with the Leader of the County Council last week who intimated that he would have an important announcement at Tuesday’s County Council meeting, and indeed he then announced a £750,000 community grants programme for infrastructure projects and a commitment to partnership with the sector. Good news! I think 2012 will be a year in which to read up about chaos theory; I think some organisation structures will break up, and be re-formed in a different shape. Whilst the background of financial pressures will continue, I also think there will be more opportunities for those who hold their nerve to access new targeted programmes from Government (who cannot run with 3 mill people unemployed and expect to be re- elected in May 2015) and from social finance/ philanthropy. Surrey Youth Focus is clear about what it’s doing, and our place in the scheme of things (stay small, low cost, innovative, risk – taking, and high profile for our members’ sake). And finally, my thanks to my small team of very big people – Kate Peters (Members Services), Karen Moore (social media) and Marie Silvester (Youth Development worker) – I think we all deliver way more at lower cost than could reasonably be expected from just 2.5 FTEs worth of staff, and we go into next year with confidence. Happy Christmas, and an enterprising New Year! Several important developments this week. I attended (as Chair) the South East Youth Partnership on Wednesday and it’s always useful for catching up on news from other authorities. Bucks CC have transferred their youth centres straight to local community organisations to run, with a dowry…. Excellent meeting with Louise Puntner from Surrey Chambers, and facilitated by our trustee Nigel Biggs, about our 4X4 Scheme (title invented by Yvonne Hignell of HALOW) whereby we link 4 charities to 4 businesses in a long term mentoring type relationship – skills transfer, support and advice, and perhaps funding, but that is a secondary aim. We will have this up and running with the first 4 by the end of January. I seem to have been at County hall a lot this week. First, on Monday my Chairman, David Hypher and I met with David Hodge (Surrey CC Leader) and Kay Hammond (Cabinet member – young people) about various issues, and were able to mention the prospective development of a new youth hostel in the centre of Epsom for homeless young people, which will trigger some reorganization of youth centres in the area, and be of great benefit. We are acting in a brokerage capacity with the key stakeholders. Then on Thursday morning I participated in a discussion about how Surrey CC might respond to the Localism Act. There was some muddled thinking around about commissioning, and I thought a failure to recognize that adoption of the principle of subsidiarity (correctly) needed to be preceded by being clear about what standards or norms need first to be done centrally. I also discerned a wariness about losing entrenched roles (amongst councilors of both county and district) and an unwillingness to address Surrey’s in built high cost structure of three tiers (county, district, parish), but will taxpayers put up with this in future? And finally a lovely Christmas Reception at County Hall last night hosted by the Chairman (Lavinia Sealy) and at last I’m beginning to feel in the Christmas mood! A strange, rather dark week – the international/national and hence local news is very disquieting and takes me back to 16 Sept 1992 (our wedding anniversary) when interests rates when sky high that day 22% , until Norman Lamont, the Chancellor then pulled the UK out of the European Monetary Union. If anyone thinks these international events are not relevant, you are mistaken; Surrey CC is facing another round of spending cuts already in addition to those already made, and this will impact on the voluntary, community and faith sector in due course. My concern is for the impact of all this on young people, and I am checking on statistics in two areas: youth homelessness, and on the mental health/wellbeing of young people. In regard to the after I am replacing Pete Brayne (Guildford YMCA) on the CAMHS board. Surprisingly, the latest statistics for unemployment amongst young people aged under 25 (in October) have gone down - no obvious explanation other than the resilience of the Surrey economy. Last Friday’s “Young people and society” public meeting at NESCOT FE college in Epsom went ok – 45 people or so, including a group of students for whom the key issue was how to get work experience placements as part of their course. We had a Keeping in Touch meeting with Surrey CC’s Assistant Director for Young People (Garath Symonds) on Wednesday, and it seems that the Surrey Youth Consortium has done ok in the bidding process for contracts but no formal announcements are yet made. Quiet satisfaction. I was then at County Hall again on Thursday giving evidence to a Select C’tee about the cuts in grants to voluntary infrastructure bodies and its intention to move to a commissioning model. The SCC officers have been very open and collaborative in their working and this was acknowledged. I then has a Sports Partnership in the afternoon, working on the action plan to implement the Sports Strategy. My mood for the week has not been helped by being stuck on the A3 yesterday for over an hour because of an overturned lorry, then spending an hour getting out of Guildford in the evening, and hearing rather discouraging news from the Lottery about a grant bid, though I am pressing on with it, but to a different funding stream. The good news is that a further grant payment is being paid by Surrey CC that enables us to retain our youth development worker during 2011/12. Off now to the Children and Young People’s Assembly – more next week. I see that in an opinion poll the charity sector was the 3rd most trusted institution (after the Army, and the NHS). In the same posting (from Third Sector) Kevin Curley of NCVO warns against charities getting too close to corporates (and social finance). I sense that we’re getting to a dividing point in the sector soon. Some charities will continue to rely on local support/funding, and/or be part of a national body (like Scouts/Guides) and avoid any form of contracting, or social enterprise. Others will set out to win contracts within a commissioning process and/or to become social enterprises. In short there will be a sharper "mixed economy" within the sector in future in my view. However commissioners (mainly local authorities) will have to be careful that they don’t find winning contractors that are strange bedfellows - I make this point in relation to the new commissioning process that Surrey CC is engaging in for support service bodies (from 2013). These thoughts were prompted in particular by three events this week. First, our national body – NCVYS (National Council for Voluntary Youth Services) held a regional consultation meeting here, and said that views in the south-east (favouring social enterprise/finance links to corporates etc) were very different from other regions - who preferred a more traditional relationship with central/local government (only). Second, we are putting in a Lottery bid with the Community Foundation for Surrey, and Surrey Community Action to create an Innovation and Replication hub for Surrey, brokering projects for social finance, and social enterprise…so it’s pretty clear where I stand on the issue above! I also met with a youth worker who has already set up a community interest company (CiC), and is EXACTLY the sort of organisation that our Lottery bid would aim to assist. Third, I met with a housing association that hopefully will be building a new hostel for homeless and needy young people in Epsom, and it was interesting to hear of their different experiences of bidding for contracts elsewhere around the country. Off shortly to our second public meeting about “Young people and society “ at NESCOT FE college in Epsom. This morning’s breaking news is about a new Government initiative to address youth unemployment….whatever happened to the Future Jobs Fund? Ah yes… I remember! And finally met, in a private capacity, the Appointments Secretaries of the Prime Minister and the Archbishop of Canterbury - being consulted, with many others, about a new Bishop for Chichester – now that’s different! Family lunch on Sunday to celebrate: eldest son’s new granddaughter and a new breakthrough job (his, not hers! ), youngest son getting engaged at last! Any excuse for serious food. Enjoy the week-end…and start of Advent. This has been a frustrating week, blighted by the loss of internet access and the ability to receive incoming emails during the day, but only overnight en bloc. However, as of Thursday we were back up and running properly, but do not mention the words "BT Broadband" for several weeks please!! So a rather thin week I’m afraid. I had a “realistic” discussion with my Management and Finance trustees on Tuesday about our “planned crisis” for next financial year, and then, having had a “difficult session with my MA tutor that same evening, just as I was slipping into the slough of despond (ish)…..up pops the wonderful Lottery! The SE Regional Manager of the Lottery very kindly sent me details of the new £6 mill fund in England to promote social finance brokers such as us, and we will be bidding, but also to kick start projects that are in gestation. We have four of these that have languished somewhat and could benefit from the acceleration that a Lottery grant could fund. See details on our website. So I end the week on a high with the prospect of working hard to bang in at least two bids by the due date (14 Dec). We have our next public debate about young people and society on Friday 25 Nov at NESCOT in Epsom, and I am looking forward to that. The news about youth unemployment is not good – now 1million …there will be real adverse consequences…. and in Surrey it is increasing slowly – to 3,410 at September. I showed our “Every piece matters” film about needy young people again at a Surrey CC Equalities group, chaired by County Councillor Kay Hammond (Cabinet member) where I had the floor to talk about the 135,000 young people (10-19) who constitute a significant segment of Surrey ’s population. The film had a considerable impact. We had our AGM and Open Forum on Tuesday evening attended by some 42 people, which was impressive for a small organisation like us. Grateful to the Lord Lieutenant, the High Sheriff, the Chairman of the County Council and our new President, Lord Robert Baden-Powell for attending. Vicky Westhorp from Cabinet Office (Office of Civil Society, South-east) was our principal speaker; she gave a detailed account of the impressive extent of the Government’s actions to promote the Big Society. Then Ian Burks (CX, Redhill YMCA) explained how he and his team had raised some £1.2 mill for the new Sovereign Centre – a community centre for children and young people with disabilities. The venue was Woking Sea Rangers superb new hq at the huge, brand new Hoe Community Centre built by Woking BC opposite their new leisure centre. Another great example of local leadership and multi–million investment by Woking’s Chief Exec. Ray Morgan….Big Society in action! On Thursday morning we had a meeting of voluntary sector infrastructure organizations funded by Surrey CC about cuts in 2012/13, and then, probably more importantly, about their moving to a commissioning process for 2012/13 onwards. I have been really impressed by how SCC officers have approached this tricky task in an open and collaborative way, and how voluntary organizations have accepted (reluctantly) the need for cuts, and are keen to move on. BUT I am not sure to what extent colleagues appreciate it just how different it will feel being a “contractor”. Hence my Delphic warnings in my powerpoint presentation to the Surrey Compact meeting in the afternoon..that was attended by, I guess, about 120 people. My powerpoint, and the Cabinet Office report on the riots, are on our website. Looking forward to the second of our public debates about "Young people and Society" at NESCOT (FE college, Epsom) on Friday 25 November at 1.00pm…just come along. Interesting week in which I sense that social finance is fast becoming mainstream. On Monday I met with two large Surrey charities to assist in developing a potential social finance project on a large scale, but which will take time to be developed. I went to the National Council for Voluntary Youth Services annual conference and AGM in London on Tuesday. The theme was “A citizen society?” Keynote speech by the excellent Tim Loughton, Minister for Children and Young people…..and he really knows his stuff. He was also emphatic that the riots were not “caused by young people” (only a quarter of those prosecuted were youths), and asked us to reflect on the geography of the events, so for example nothing happened in (deprived) Sheffield. Why not? Point being that it is too simplistic to say that the events happened in deprived areas. He also mentioned social finance/impact bonds about five times. Other highlights were: Rockcorps – encouraging the habit of volunteering by exchanging tickets for top rock concerts in return for a minimum of 4 hours volunteering, and similarly a new app “DosomeGood” to encourage volunteering. Excellent conference. Most impressive of all for me was Shaun Bailey, youth worker and Parliamentary candidate who emphasized the importance of young people taking responsibility for their lives, the need for boundaries and the great value of families, and communities as THE effective support mechanism for young people. But also a warning against hypocrisy..banks, FTSE 100 Directors pay increases, older generation ensuring its pensions whilst younger people pay for them through decades of taxes. (Ouch, bit close to home!) He is now a Big Society Ambassador. As one of the panelists at our public debate said at our Guildford "Young people and society" event, “we need a new moral consensus”…Our next public debate about "Young People and Society" is on Friday 25 Nov. at NESCOT FE College, Epsom, at 1.00pm. Just turn up. I note that the unemployment of young people under 25 in Surrey is still upwards, up to 3,410 JSA claimants in September. I was interviewed yesterday as a potential trustee for a big charity for the homeless in Chichester, West Sussex, so it will be interesting to see if I have passed! A bit more volunteering from me. And today’s trivia….Guy Fawkes worked as a steward at Midhurst Castle for some two years before the 5 Nov. Gunpowder Plot….”not a lot of people know that”..but you now do! Keep learning and enjoy the fireworks! Last Friday’s "Young people and society" debate in Guildford went pretty well, with some 65 people attending and a high quality debate, informed by the contribution of the panel including the president of Guildford (FE) College student union who was insistent on the need to re-define a values based approach tp young people – a “moral consensus” that she felt had gone missing currently. The second public meeting is on Friday 25 November at the NESCOT (FE college) in Epsom. This week saw the announcement of a new Surrey Scouts Commissioner, Roxanna Bostock from Spelthorne in succession to Richard Shortman, and we wish Roxanna well in her new role. The Surrey Transforming Local Infrastructure bid was submitted yesterday. There are four key features: encouraging mergers/ collaboration of district/borough CVS, setting up a social enterprise to deal with CSR across the county, developing common performance measures, and, importantly commissioning the development of a tool kit for frontline organizations to measure impact. 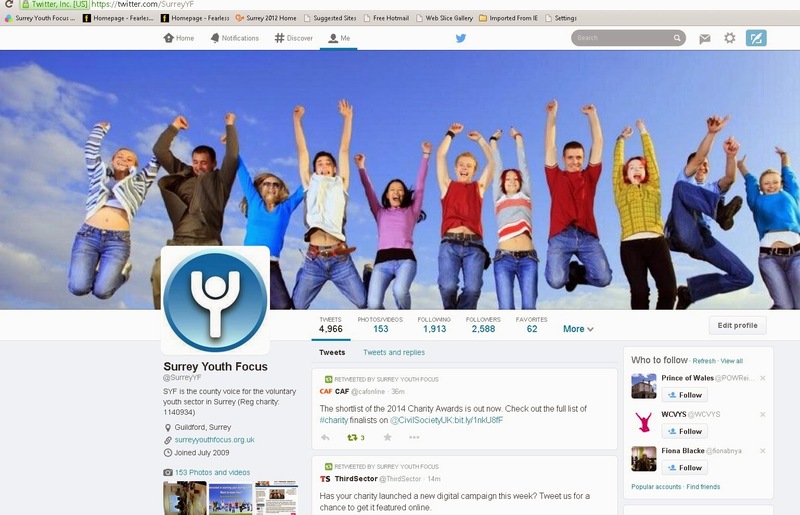 Surrey Youth Focus is not benefiting from any of the funding. BUT I have had very positive meetings this week with Big Lottery SE, and with the Community Foundation, Surrey , and am hopeful that these will lead to a successful Lottery bid around innovation and replication. The Community Foundation are beginning to do research, as am I and the PCT about youth homelessness. This links to a trip to Milton Keynes yesterday for a Social Enterprise South East invitation only event at which Nick Hurd (Minister for Civil Society) and Nick O’Donoghue (CEO Big Society Capital) were the key speakers. There was a constant theme about social enterprise, social finance and social impact bonds, and the need for the sector to be able to quantify impact and savings. There were many examples of all of these, including Big Society Capital funding a financial intermediary (£2mill) so that it in turn could fund a social enterprise (Tomorrow’s People) working with 600 NEET young people at risk of being offenders in east London. It was very clear to me that whilst these new financial and organizational models will NOT suit all voluntary sector organizations, there is and will be a big push in this direction. Weekend writing MA Theology dissertation which I am sure you will all want to know about later….much later! Lots of meetings this week – an informal meeting of Chairs of voluntary organisations on Monday evening, and then Tuesday evening was our own Trustees meeting. The Transforming Local Infrastructure bid has progressed well - thanks to Peter Arnold of Surrey Community Action (SCA), and I had a brief slot about it at the SCA AGM on Tuesday morning about the TLI. The challenge is for support service organizations (cross-county, borough specific and specialist, like Surrey Youth Focus) to work out how to deliver an effective service whilst reducing back office costs. There are some innovative proposals including collaboration and mergers (not us). On Tuesday afternoon and Wednesday morning I was co–interviewing for posts at RAISE (Regional Action and Involvement South–East ), which is repositioning itself to operate more like a consultancy and brokerage service. However, my main focus has been on preparations for Friday lunch-time's open public debate in Guildford about “Young People and Society”, for which we have commissioned the Community Film Unit, a social enterprise comprising former Surrey CC Future Jobs Fund trainees, to make a short film about the life experiences of some young people who had become marginalized. The film is very powerful in conveying the depth of difficulty that some young people experience…including the young man who was kicked out of his family when aged 14. I link this to an article in Children and Young people Now about a young woman who was also homeless aged 14 and after years on streets, sofa surfing and in temporary accommodation has at last found a bed at Woking YMCA's new hostel for homeless young people. Youth homelessness in Surrey is a gap in the Surrey Joint Strategic Needs Analysis (JSNA) with health, and I am now just beginning to work on our Research Report that will cover this and doing so with the PCT. It is stunning what incredibly tough lives some young people have, and who are, I fear growing in number. Report on the debate next week. Another fairly tense week with an underlying theme of the Transforming Local Infrastructure bid in progress, and discussions with the County Council starting about grant cutting for 2012/13, and the introduction of commissioning for 2013/14. More positively we have got the papers out for our Trustees meeting next week, including the Annual Report and Accounts for last year, which we see as a key marketing document. We have also been sending out floods of emails about our first “Young people and Society” open public debate in Guildford on Friday 21 October. Great meeting about this at Guildford College yesterday with the Interim Principal and the Student Union President who will be on the Panel for Friday. Hopefully the College will be able to film the event which would be brilliant. Talking of “society” …..interesting to hear this week from Sue Berelowitz, a former Surrey CC colleague and now Deputy Children’s Commissioner that "Right now thousands of children are being horrifically abused by gangs” . And then also this week the Care Quality Commission’s review of care for the elderly in 100 hospitals found “concerns” in 55/100, and downright illegal treatment in 20. What does that tell us about our society? I was invited by the Chairman of the County Council to lunch at County Hall to hear a speech by Matthew Bowcock, chairman of the Community Foundation Network nationally. His theme is, like mine, that charities need to break out of the dependence on government grants and contracts and become more self funding. By contrast the closing date for the Surrey CC services for young people was 12 October, including the submission of individual contracts for the 31 youth centres…which transfers huge costs of time and effort to the bidders. Off now to a South East Youth Partnership (SEYP of which I am Chair) workshop on Commissioning with the Oftsted Inspector, Tony Gallagher, who wrote “An evaluation of approaches to commissioning young people’s services” . His report and my update on commissioning are on our website. Good weather this weekend… We’re all Welsh now...grand-daughter now doing ok. Neglected Theology dissertation calls though! A tense week with lots of work towards the Transforming Local Infrastructure bid which is going well and setting out proposals which, if accepted by all partners, would be genuinely transformative, recognizing the difficulties of overcoming our local prejudices in a two tier county. Politics, which is what this is the art of the possible and practicable, so the results may not be an Ideal, but will be transformative and progressive. This morning has seen a parallel process with Surrey CC discussing with its beneficiaries how best to reduce its grants to the sector by up to 30%, and how to prepare on both sides, commissioner and contractor, for commissioning from 2013/14 onwards. All this being relevant to Surrey Youth Focus as an infrastructure organisation. An underlying issue for the sector is to see beyond the binary relationship of central/local government as commissioner, and voluntary sector as contractor, to a wider triangulation that recognizes the contribution of corporates / social finance/ social philanthropy. I am being invited up to a Ministerial event later this month with a few others to discuss exactly this - more afterwards. I have also been busy promoting our public debate in Guildford on 21 October at 1.00pm (see website) about Young people and society. Part of my tension this week has been that I have become a grandfather for the third time, but the baby was early and weighs just 3lbs 3oz. She stopped breathing twice on Wednesday. It is amazing what the NHS can do in critical care. The baby seems ok now. More rugby ( England v. France tomorrow) and 10 friends to dinner – I am cooking as my wife has been pretty busy this week with other grandchildren. So I am hoping a difficult week will end with a jolly time…off to buy the wine! Interesting week – very important discussions on Tuesday morning between the County Council and infrastructure organizations – CVS, Surrey Community Action, ourselves and others, about funding for next year, and the Council’s intentions to move to a commissioning model from 2013/14, so 2012 becomes the preparatory “get your act together year”. This links to a parallel stream of work I have mentioned before, namely the sector’s own bid for the Transforming Local Infrastructure grant of potentially £600,000. The good news is that the sector is moving quickly now to shape quite radical (though not new) proposals which have a chance of success because the £600,000 would ease the undoubted pain of transition. However it will feel very different for the sector to become a contractor within a commissioning model, and there are in my mind two conditions which the sector has to address: first, that the infrastructure organizations have to become a consortium (like the Surrey Youth Consortium) to be able to bid against the likes of Capita and Serco, and secondly the sector has to see beyond just being commissioned to its wider role outside of being commissioned to assess need and to secure funding from social philanthropy and social finance. Which brings me to the four social finance projects we’re trying to promote, and that HALOW had a really positive meeting with Surrey CC commissioners about moving out – county young people with disabilities into supported living in-county through HALOW’s work . It is a potential social finance loan if not a social impact bond. Very encouraging at last. We contributed to a Surrey’s Big Society report to the Surrey Strategic Partnership on Wednesday evening; interesting to note that West Sussex CC has already set up a fund to promote new social enterprises, as well as the same Big Society grants fund. New Leader at Surrey CC with Dr Povey standing down and Cllr David Hodge taking over. My Chairman and I were due to meet David Hodge last week in his capacity as Cabinet member for Finance, but the meeting was cancelled because of these changes - we will rearrange! And my good colleague, Jean Roberts–Jones, CX of Surrey Community Action left yesterday to take up a new, and similar post in Eastleigh where she lives, and we wish her well. The arrangements for the two public debates about “Young people and society “ – Guildford 21 October and Epsom 25 November are now in place and we are promoting widely, so that we can have a vibrant public discussion. No space to tell you about productive meetings with “Moo Moo Youth Marketing”(sic), or the Surrey 14-19 Partnership – more next week. And finally England rugby continued to progress nicely against Rumania (ok their second team) but the game I have been apprehensive about is tomorrow 8.30 am ITV1 against Scotland. For the two of you not interested in the rugby, there is always a SCORCHIO week-end!! A quiet week by my standards mostly organising the forthcoming public debates about “Young people and Society” to be held in Guildford on Friday 21 October from 1-3.00pm at St Saviours Church, and on Friday 25 November at the NESCOT college in Epsom also from 1.00 to 3.00pm. We have a panel of speakers and it should be an interesting public debate. One of the background factors about our society is reflected in the UNICEF report on children’s wellbeing, researching why UK children aged 9-13 are so unhappy compared to counterparts in Sweden and Spain, and this is on our website. We have also put up on the website a superb report by New Philanthropy Capital on “Early Interventions: An economic approach to charitable giving” that assesses the economic savings from early interventions and encourages the social finance market to invest in this area. Whilst the case for early intervention has been known, and proven for over a decade, we have not taken it forward significantly because of the argument about double funding (maintaining existing services whilst also targeting high need families) and public authorities have typically not afforded it. The social finance argument removes this difficulty by using an alternative funding stream, but does still depend on public authorities being able to discern cost savings. We had a really enjoyable team awayday on Tuesday planning our modest move into charging for some services on a consultancy basis as a way of moving towards our target of diversifying funding sources. This followed a half day training course on consultancy skills on a pro bono basis by a consultant. I think we all feel very energized by the prospect of what we intend to do …and we have an action plan. It was a really positive session. Then we have the development of Surrey’s Transforming Local Infrastructure grant bid (£600,000) that has to be submitted by the end of October, and a consultation meeting about it today. I am off to Cornwall on Friday for a long week-end with that part of our family that includes the grandchildren so that their parents can go to a “no children” wedding in Cornwall on Saturday. Rugby ( England v. Rumania ) is at 6.00 am on Saturday morning, so it’ll be a long and exhausting day ! Maybe not such a quiet week after all! Well this has been an odd week for various (undisclosed ) reasons. Moving quickly on – it was gratifying to receive high praise from our external examiner (auditor) on Tuesday for our Report and Accounts 2010/11 and be told we are a “very well managed charity”. Trustees and I realise that the Report and Accounts is a key marketing tool and opinion shaping device. I had a long conversation with a colleague Chief Executive about the possible application of social finance in his area, and it seems that whilst not a panacea there is a growing awareness of the potential of social finance. My grant bid to a GMT in this area has been acknowledged and is being assessed – fingers crossed. The study visit by the DfE last week has led to some follow ups and this is really encouraging. Surrey Sports Board (Wed) is now working on the implementation of strategy and I have convened a meeting of our members from the Sports sector next week so that we can share achievements and concerns and information about funding and other opportunities. This will build into the Research Report I’m writing as an influencing upwards report about the voluntary youth sector. We have a Team awayday next week to plan our consultancy work and to address related matters in the business plan. The public meetings about “Young People and society” to which we have invited MPs are now set up for 21 October in Guildford (St Saviours’s Church) and in Epsom (NESCOT) on 25 November – both are from 1.00pm – 3 pm. In this context it was interesting to skim read this week’s UNICEF report on Children’s Wellbeing (aged 8 to 13) focusing on UK children compared to those elsewhere in Spain and Sweden, and subtitled “The role of inequality and materialism”. Which brings me quickly to the fact that on Saturday I’m going swimming with son and grandson, aged 3 (the UNICEF report emphasizes the importance of the extended family), and of course to Sunday at 7.00am ITV1 England v. Georgia …following the win against Argentina. A week when all around me seems to be changing. I am part of the Surrey Transforming Local Infrastructure bid team which is being led by Surrey Community Action (generic infrastructure body), after a vote amongst the 43 organisations interested in the TLI in Surrey. We have a small bid writing team from 7 voluntary, community and faith sector infrastructure bodies. The bid will be for the £600,000, and must be evidence based and transformative. There are tensions in a two tier county between county-wide and local infrastructure bodies, to say nothing of specialist ones like Surrey Youth Focus. A great challenge, but also a great opportunity….we need to take it because expenditure cuts and commissioning will compel a more radical coming together in the VCFS ..or the death knell. So the future in this sphere lies is in consortia where individual organizations – SCA, CVS, etc all retain their unique identity and independence, but agree to pool expertise to bid for large contracts. Talking of which we had a very interesting study visit on Wednesday from the DfE and the OCS about the innovative work we’re doing in Surrey as between the commissioning role (Surrey CC’s Services for Young People), the Surrey Youth Consortium as a provider, and Surrey youth Focus in our enabling and brokering role. Our message to our Governemnt colleagues was that Surrey is being massively innovative and we should be tapped into more by Government. It was a useful meeting. We are setting up two public meeting (in Guildford 21 October and Reigate / Redhill on 25 November) about “Young people and Society” from 1.15 – 3.15pm. to enable public discussion of recent issues. I had a RAISE (Regional Action and Involvement South –East) Board meeting in the week – RAISE is re-organising and reshaping itself too, and being led superbly by its Chief Executive. Am waiting to hear about success or otherwise of a grant bid to a Trust; this is an attritional process of bidding until successful.. bit like job applications. And now for the important bit: England v, Argentina Sat 9.30 am ITV1 in the local pub..full English breakfast and pint of Guinness.. England win..happy days. There is no alternative, as a (in) famous lady once said!! The week has been dominated by the important discussions about who the agreed bidder might be for the Government’s Office of Civil Society funding of the “Transforming Local Infrastructure" grant. There has been a great deal of interest in this funding- potentially £600,000 for Surrey, BUT there can be only one lead bidder, and the content of the bid must be genuinely transformative of the sector. The upshot is that Surrey Community Action will lead a Surrey bid in collaboration with many others including the CVS network, Age UK and of course Surrey Youth Focus. Having resolved who the ONE lead bidder will be, the next stage is discuss and agree the nature of the bid (by 31 October). The bid will need to meet the criteria set by the Lottery and reflect some shared vision about how the sector should transform, reduce costs, and improve services to the frontline. There is widespread agreement that there is duplication and possible cost saving, and it is essential to develop this belief into a shared vision of what an improved infrastructure network should look like (inevitably a hub and spoke in some form) and convert that vision into practicable projects. Quite a challenge, but a potential £600,000 is a very useful “carrot” to encourage change alongside the “stick” of cost cutting pressures we all face from reductions in grant income. We have written formally to the eleven Surrey MPs, who are a very distinguished and influential group, inviting them to participate in two public debates about “Young people and society”. We have secured a bit of funding to make a short film using the Community Film Unit ( a social enterprise formed by successful Future Jobs Fund trainees) interviewing needy young people about their experiences leading up to their current predicament, and what if anything could have made a difference at a key point. The point of the debates is to flag up the achievements of young people, but also the increasingly severe challenges that young people face. A long weekend beckons...obviously the key is Ireland v. England rugby international, plus involvement in a local community arts festival , and re-starting my focus on the MA Theology and this academic year’s dissertation…Last Bank Holiday til Christmas….enjoy!! I enjoyed my camping weekend in Dorset …lots of meteors in evidence, and seriously nice barbecue food …quail, black pig loin of pork (French pigs) and a bean/tomato/garlic sauce!! And of course, for someone born in Kent - Shepherd Neame Old Spitfire (beer). But that was then, and this is now – it has been a busy week…I have agreed with my Chairman and the Chair of Surrey Youth Consortium to write to the Surrey MPs about the aftermath of the riots (outside Surrey, but close enough in Croydon) proposing two public debates which we will host in Guildford and Reigate/Redhill, about “Young people and Society” and inviting one or more MPs to participate in a panel discussion. We will be filming the experiences/views of young people (both needy and mainstream) as a prelude to the debate, and supplying some facts/figures about the achievements of amazing young people in Surrey . There is a lot of interest in an Office of Civil Society/ Lottery Transforming Local Infrastructure grant, which is potentially £600,000 over 18 months, but for which only ONE organisation can bid…and there are potentially two bidders – Surrey Community Action, and Surrey Voluntary Action Network (the district/borough CVS) . If the Lottery receives more than one bid, they will bin the lot. At present it does not seem possible to agree on which should be the ONE lead, and so there is to be a vote amongst the 43 organisations who have expressed an interest in the Surrey TLI…..shades of Eurovision Song Contest, and a risk that a popular, but weak bid might win, but not be strong enough in competition with other counties. Key meeting next week. We are supporting the SCA bid. I have also begun work on a new venture – a Research Report for the sector in 4 Parts – National picture (Government policies etc), Surrey trends, Views of member organizations about their Achievements and Concerns, and my Conclusions. Should be ready in mid Sept. Interesting to note that youth unemployment keeps going up nationally, and is now going up again in Surrey and I am hastily writing the Annual Report for 2010/11 in time for a sub – committee meeting of Trustees on 13 Sept. So I’m back to severe busy-ness, but it’s a sunny week-end in prospect ..Test Match, but I have to clear out the shed. Hope you have more fun than me!! Hope you’re still there after my two weeks in SW France, near Albi/ Toulouse. It was very relaxing and restorative, just what a holiday should be. I returned on Monday to a massively fluctuating Stock Market and Bond market; UK manufacturing flatlined; a down -grading of the UK growth forecast; the shooting of Mark Duggan last Thursday, 4 Aug, and the riots and looting last weekend and in the early part of this week. Unremitting bad news. A spark of hope lies in the response of local communities in the “broom army” clearing up, and the massively dignified and significant appeal for calm by Mr. Taraq Jahan whose son was one of the three men knocked down and killed in the hit and run car attack. Mercifully in Surrey we escaped all this, but it remains shocking, and challenging. I have been focused on catching up on emails and the backlog, but had a great meeting on Thursday about devising a bid for a HUB, whereby in Stage 1, NEET young people would register on a website and we would then take control of their journey into a short course to raise self-esteem, confidence and skills, and thence into volunteering, training and employment. In Stage 2 of the project we want to enable young people to set up social enterprise/become self employed…and run the HUB as a social enterprise itself. This work is in collaboration with Surrey Care Trust and Surrey (Furniture) Re-use network- itself a social enterprise – and we are heading for a Reaching Communities bid. I am totally convinced it is this sort of initiative that will make a difference to the lives of young people who may be at the margins of society. Part of my holiday reading was a brilliant book by Andrew Mawson called “Social Entrepreneur” – his story (see Google) is amazing and inspirational. Short version….things happen locally, organically (not through government) through brilliant, ordinary people…government should invest in what has been proven to work. Recommended reading. And so I end on a positive….lots more to say next week: the newly published Oftsed review of commissioning in 12 areas including Surrey, the Transforming Local Infrastructure bid in Surrey, and so on. I am off camping in Dorset this week-end with my three 30 –something sons, and 3 year old grandson…we will have serious fun! A quiet week by my standards with a focus on preparing papers for our Trustees meeting on Tuesday evening which went well, and we were delighted to welcome Nigel Biggs as a new independent Trustee (as opposed to a Member Trustee). His business expertise and links to the company and university sectors will be invaluable. Met with the management team from NESCOT FE college on Wednesday to discuss close links and also the idea of a virtual hub whereby young people who are NEET can come into the hub to receive training to uplift their self-esteem, and be offered volunteering work and accredited training at a college , leading to a job. We see this Hub as a social enterprise. I am Chairman of South-East Youth Partnership which as a network of senior local authority heads of youth services and voluntary sector youth organizations like ourselves. We had a very useful meting on Thursday sharing experiences, from which came concerns about: whether outcomes can be commissioned; variations in transferring buildings to the vol sector..Bucks CC are doing so on a 25 year lease(!) and closely related to this the (im)possibility of running a youth centre as a profitable social enterprise without a much broader level of activity going on; a worry that volunteering may dry up if seen as substitute cheap labour for a service that has been withdrawn, and so on. Just a reminder that the DfE has its “Positive for Youth “ (embryonic White Paper) on their website with some 12 discussion papers. My close colleague, Jean Roberts – Jones, Chief Exec. of Surrey Community Action has announced she is leaving to take up an equivalent post with Eastleigh CVS, just 2 miles from where she lives! I went last night to the packed celebration evening at Denbies vineyard for the The Studio – ADHD centre. What was interesting was the view of a psychiatric consultant, and a research psychiatrist at Kings College London that the cause of ADHD is an imbalanced brain at birth, which is slowly changed through maturation during childhood and youth. However, during this process of maturation the young people have “Ferrrari brains” (top speed, maybe fragile) that is the cause of the high energy, often unsocial and inattentive behaviour. The stories of the achievements of the young people in being coached by Nancy Williams through this phase of their lives were great. We also heard the “other side of the story” from two long suffering but supportive parents of ADHD kids that were particularly moving. Interesting to note that the forthcoming Government Youth policy will include a section on brain development. Well done Nancy ! I led a business planning session on a consultancy basis yesterday morning; one organisation faces the ending of Surrey CC grant and the loss of its youth worker, as indeed we do unless I find replacement income for our youth development worker. The challenges are really severe. I was also at a Trustee Board meeting of a fairly large voluntary sector organisation where we were addressing the issue of how to change it, or close it, in the face of loss of grant income. “No change” was NOT an option, and we opted for a strategy of significant reorganization that will regrettably involve a loss of staff, and a complete re-engineering of the organisation. We now all work in what I call a chaotic environment (cuts, redundancies, reorganizations, mergers) where potentially old models of service delivery could be transformed by closer collaborative working between the statutory, voluntary and corporate/social philanthropic sectors. This requires leadership and a style of collaborative working that many organizations will find difficult…I was pleased to attend the first meeting of voluntary sector Chairs in Surrey , brought together by my Chairman and the Chairman of Surrey Community Action. My role was simply to take the notes. It was encouraging that the meeting took place. It has been a busy week with two evening meetings (and a third church meeting at home), but a kind person with whom it is a joy to work has sent me some holiday reading – a book by Andrew Mawson called “The Social Entrepreneur”…and therein lies the clue for the future, in the week that the Government’s White paper on “Open Public Services” was published. This has been a functional kind of week, writing reports for Trustees – Risk Register and so on. But I had an interesting private meeting with a County Councillor to convey my views about how things are going which is…stickily, by which I mean the voluntary sector is under pressure financially and organisationally and the opportunities afforded by Localism, outsourcing and so on seem limited. Nevertheless, a well-informed colleague from a member organisation was expressing optimistic views to me about the opportunities for the voluntary sector from the current County Council youth work contracts, but I guess it depends if our member organizations do in fact win them - I am sure they’ll win some. We are about to launch a marketing campaign to new member prospects using our very smart new folders into which to put material about who we are, what we do, our offer and the benefits accruing to members. On Thursday evening I did some consultancy work with a brilliant member organisation – Guildford CHIPS – an Easter/ Summer play scheme in the high priority ward of Westborough. They have two successive “Outstanding” Oftsted reports. Interestingly, last year by this stage they had received bookings for over 300 day places from Social Services but to date they had just 2 referrals. Equally, they were finding that whereas last year parents were booking at a week or two at a time for their kids, now it was just one day or two - an interesting reflection on the impact of cuts and the recession. The challenge for CHIPS is that their Lottery funding expires next March…what to do was the issue. I am walking 12 miles over the Sussex Downs (again) with my former Vicar who is walking the bounds from his current parish in Redhill to all his former parishes, so we’re walking from Midhurst to Chichester ..sunshine and heavy showers forecast ..which just about sums up where we are …mixed fortunes. Hi - This has not been an even remotely normal week…. My week began last Saturday when embarking on a 4 day dash to walk the South Downs Way from Buriton (nr Petersfield) to Beachy Head ( Eastbourne )- it’s about 80 miles. We cheated slightly and started at South Harting – only because of considerations of time and distance. My son and I had a really good first day – getting to Houghton Bridge nr Amberley and staying at a superb B&B. BUT on Tuesday I managed to get at returned ticket for the otherwise sold out performance by candlelight in Chichester Cathedral by “The Sixteen” – the choir conducted by Harry Christophers. I had a great aisle seat in the third row, and watched and listened in seventh heaven to the religious music of the Spanish 16th century composer Luis de Victorio, who was born in Avila…..same place as the great Spanish saint and mystic, Teresa of Avila. I had the CD already…big fan both of Victorio and The Sixteen. Then on Wednesday, we went to the garden party at Buckingham Palace (as you do, but with3,000 others). The weather was perfect – the military bands played …the tea was very superior….the gardens - parkland and rose gardens - were beautiful, and in the distance was the Queen. It was a very elegant and enjoyable occasion. As was the dinner afterwards at our son’s restaurant….and was free!! If I have to talk about work, I am delighted to say that Dr Beccy Bowden (Surrey Satro) has agreed to become a Trustee, and so with Beccy and Nigel Biggs in place on the Board we now have very good links to the business sector. A quieter week- end is now in prospect. Anyone for tennis? I have just finished proof reading the next edition of Surrey Youth News (our 50th edition) and am stunned by the amazing amount of fund raising that is being done by our members. Woking YMCA has just opened a new £2.6 mill 24 bed residential facility for vulnerable young people; Redhill Y have just raised £1 mill for their centre for disabled people, but also Halow, Disability Challengers , Matrix…the list is endless…and the energy, enterprise and courage of the walkers, cyclists, runners, abseilers is remarkable. Very inspiring. I was at the Joint Cadets meeting on Monday evening, and am struck by the fact that there are some 2,000 Services cadets in the county, and by the dedication of the retired officers supporting them. Tuesday was the Surrey Community Action Annual Conference, at which I was running a workshop on Social Finance. This was closely followed by an 8.00 am breakfast event at Brooklands by Surrey SATRO and the Surrey Chamber for young people about opportunities in science and technology. That same evening was the Chairman of the County Council’s formal local government dinner…lots of interesting discussions. SO….I have done a lot of listening and talking (“networking”) over the last few days, and I am clear that there are two forces at work pulling in different directions: we have the Big Society, the Localism Bill, the Giving White Paper and the forthcoming Civil Service White paper- all pushing in the direction of empowering individuals, families and communities. And yet we also have a political and managerial psychology that says “people can’t be trusted”, “the vol sector will mess it up – keep it in house”, and that control and cost saving is preferred to empowerment and local diversity…so for example Academies report directly to the Secretary of State for Education. The net result is that at present we are stuck in the “don’t know whether to centralize (save costs/ commission/ procure/ control) mode”, or let go…and decentralise. Some are reluctant to innovate and indeed to lead, and so there is a risk of organizational paralysis, risk aversion, and adherence to familiar (bureaucratic) processes. Which brings me in a roundabout way to the increasing complexity of the current four youth service contracts, and, separately to the difficulty we’re having in getting Surrey CC to engage about its residential care costs for young adults with disabilities, which we think can be substantially reduced by one of our member organizations enabling those young people to be enabled to live independently in the county. A long arranged and key meeting was cancelled at nil notice. The contrast with my meeting last week with the social entrepreneurs prepared to invest in this project is just stunning. I wonder which of these countervailing forces will win out in the long run, both nationally and locally ? I will ruminate further whilst spending the next four days (Sat- Tues) walking the South Downs Way with one of my sons (nearly 80 miles – Buriton, nr Petersfield to Beachy Head ). On Wednesday my wife and I are at a famous garden party in London , and then having dinner at another son’s restaurant (Magdalen, Tooley St.). Fashion, food, and gardening tips to follow next week! Plenty of sun cream this week- end – have fun. A reflection on the state of play in the week that has seen the rethink on the NHS…… I have had conversations with people from Common Purpose in London, Guildford Diocese, Community Foundation Surrey, Children England, a couple of social philanthropists, Surrey University, and others….I fear that at central and local government there are two tendencies at present: first an ambiguity about localism, decentralization and the Big Society when confronted with the realities of politics and the (apparent) need to retain control at the centre. Second, in consequence, a fearful instinct to focus inwardly on an agenda of cuts, reorganization, and retaining control in the face of current expenditure cuts and, courtesy of the probability of Greece defaulting and contagion spreading to UK Gov and banks, a serious risk of more local cuts additional to those we already know about. Where are the leaders through this? I am pleased to say that in Surrey, my Chairman and the Chair of Surrey Community Action have put forward a proposal to other leading Chairs in the sector to develop ways forward for the voluntary sector. Encouragingly, I had a great meeting with one of our member organizations, Halow, and two social philanthropists about taking forward a particular proposal and I am convinced we can make this work. We had an Open Forum meeting on Tuesday evening at the BFree café in Leatherhead (a former church) when the key speaker was Wendy Varcoe from the Community Foundation, Surrey. The CF already gives some £600,000 in grants to voluntary organizations, and is a very significant local funder. I am running a workshop at next Tuesday’s Surrey Community Action annual conference about social finance, and lest you should think I’m daft – did you see the headline this week? – “Social impact bonds will be worth tens of billions of pounds” Sir Ronald Cohen tells MPs”. Sir Ronald pretty much invented venture capital , and now is pushing social finance.. I rest my case! The Department of Education officials writing the forthcoming White Paper on Youth are coming down to see us in September, as an example of an organisation doing interesting things, in conjunction with Surrey CC – we will be hosting the event. Good example of our advocacy and representation for the sector. Personal: Off on Sunday to middle son’s flat in London for Sunday lunch (Father’s day ? Don’t recognize it – just a commercial contrivance) BUT as he is a professional chef/ patron of a successful restaurant in London, we will get a serious lunch…..after I have taken Matins for Trinity Sunday in a beautiful village church in West Sussex. Another really enjoyable and interesting week…and I get paid for doing this! On Tuesday I was in London at an excellent NCVYS Youth Strategy Group at which there were presentations by senior people at the DfE about their forthcoming policy paper on Youth. I must confess I was not aware this was in progress, but a lot of work has been done already and published. Details are at: positivefor.youth@education.gsi.gov.uk. The second discussion subject was work on Social Finance by the Michael Young Foundation, indicating the scale of opportunity an interest in SF. The point is that whilst contractual arrangements will continue between the sector and local authorities (the binary arrangement) there also needs to be a triangulation with the SF sector. NCVYS to their great credit are setting up a retail fund derived from the Big Society Bank to enable youth projects to be financed. NCVYS are showing great leadership in the sector nationally. I then went to a Community Foundation Surrey business planning awayday which was again fascinating and reinforced the messages from the Young Foundation. The Community Foundation already give £600,000 pa in grants to the sector in Surrey and have a target of getting to £1 mill grants in 2015, so I am delighted that we have their Chief Executive , Wendy Varcoe coming to our Open Forum next Tuesday evening (see website for details). Yesterday morning I met with folks from Bourne CYI, a member organisation doing great work in the Farnham area, and we had a discussion about how they might come together with others to form a more consolidated offer to external social financiers. They are based at the very fine St Thomas Church in Farnham – an uplifting morning…. We realized that Surrey Youth Focus, and Surrey CC are doing innovative work, so I am inviting the DfE civil servants down to a joint briefing session about our work. Personal disclosure: Off to a Readers (lay preachers) Conference on Saturday, so my spiritual uplift will continue! Enjoy whatever you do this week-end. This has been a good week for Surrey Youth Focus. Cutting costs: we have cut costs by giving up one office, and consolidating in just one room, but the bonus is that our room is being redecorated…for a modest £25 investment in paint and the work of Surrey Community Action’s Future Job Fund trainee office handyman, who is great. Our very own Future Jobs Fund trainee, Sophie, has not only completed her one month’s training to become a Special Constable with the met Police, but she has also got herself a full time job as an office administrator for a company near where she lives. I think we can all take pride in her achievement and regret the demise of the Future Jobs Fund. Fund-raising: largely through the efforts of our Chairman we have been given a generous grant this week by a Grant Making Trust fund that is a welcome contribution to our income for both this year and next, but we still need to do more, and have several irons in the fire. Strengthening Trustee Board: we are delighted to have a new Trustee, who has a huge amount of experience in business, and has close links to corporates in Surrey and to Surrey University . I am constantly making the point that the old binary relationship between central/local government and the voluntary sector needs to be re- shaped into a triangulation with the business and social philanthropy sector, and this Trustee will help us do that. Collaborative working: The Memorandum of Understanding between ourselves and Surrey Community Action was approved by their Trustees this week, and will go to our Trustees on 19 July. This effectively establishes a collaborative partnership between us as independent organizations, and again is the pattern for the future of umbrella (infrastructure bodies). So it’s been a good week , and the sun is shining for the week-end! Last Friday saw the launch of an important report- “Surrey’s Bigger Society” – on behalf of the Community Foundation, Surrey. The event was held at the Lightbox (civic museum) in Woking, and was by invitation. It was chaired by Mathew Bowcock in his capacity as a Chairman of the Community Foundation Network nationally. The launch was preceded by a totally brilliant performance by young people from Peer Productions of an extract from their latest play about Alcohol. It took the form of a musical contrasting the perspective of doctors and nurses in dealing with the drunk and damaged, and those who started off wanting a “good night out”. The production, acting and singing were all terrific. This then led into the launch of Helen’s report (following her previous “Hidden Surrey”). The new report emphasises the relevance of social finance and social enterprises. I was asked to give a short talk about our work on social finance projects with Surrey CC. Other speakers suggested that Surrey, of all places, is extremely well placed to take a lead in promoting social finance as there are so many people living in Surrey with the top level and financial skills, and indeed investment capacity. Lord Nat Wei was present, and I was able to have a chat with him, and others. The Chairman of the County Council, Lavinia Sealey was clearly impressed by all she had heard, and there was a collective sense of the need for a continuing dialogue between social philanthropists, the voluntary sector, and local authorities. It was an exciting time. The sense of significant change has continued this week with a meeting of my chairman and that of Surrey Community Action to agree a Memorandum of Understanding about remaining independent but collaborating together, so, in effect forming a loose network together. I absolutely think this is the way forward for smaller organizations (and “organizations as networks” was the subject of my M.Phil. from back in 2000). This collaboration is leading to further thoughts about the leadership of the sector, about which more later….Exciting times!! Personal disclosure: Yippee grandson for the week – end, such fun!! Manchester United to win on Saturday…hopefully! This has been a quiet week by my standards with the focus being on our funding campaign. This has now commenced with letters and a Supporting Statement being sent out to various key people, and the start of preparation of the grant bids to go forward over the next few weeks. This is crucial to sustaining our capability in 2012/13. I am very conscious of the deadline of a Trustees meeting in January 2012 by when I need to have brought in funding, or risk being “passed the black spot”- note the oblique reference to “Pirates of the Caribbean ”!! We have a very clear funding strategy and it’s now just a matter of bashing on until we’re successful. The Surrey Sports Strategy was launched at the Surrey Sports Board Conference at Kempton Park on Tuesday. I am a member of the Board. The Strategy is quite high level, but short, and the detail will be fleshed out by working groups. A copy is on our website. The London 2012 (Olympic) Games was much mentioned – there may be half a million spectators watching the cycling race through Surrey next year – a great marketing opportunity – 2,000 volunteers are needed on the day. It’s a great opportunity for uniformed organizations. Delighted that Nick Wilson has been made Surrey CC’s Director of Children, Schools and Families Services. I am off to Woking this afternoon for the launch of Dr. Helen Bowcock’s “Surrey's Bigger Society” report for the Community Foundation, Surrey . It is an important report – more on this next week. Enjoy what seems likely to be a sunny week-end! Back to blogging after Bank Holiday leave and various events. Surrey Youth Focus is not immune from the changes- our costs are fixed (zero % pay rises for a 3rd year) but our income from grants and projects has fallen, so we have set a deficit budget for this year, like many others, and have to deploy our strong reserves – which his what they are for. However, we have now begun our funding campaign for 2012/13. We have also agreed at Chairman level, subject to Trustee approval, to have a formal collaborative agreement with Surrey Community Action. There are other green shoots – I am delighted to be instrumental in setting up a social enterprise to provide employment for unemployed young people. The Community interest Company (CiC) is being formed now, and will start to trade in Quarter 4 this year - more later. We are progressing various social finance projects, and I do think that the way forward rests with social enterprises, and social finance as supplementary sources to the major contracts that are awarded. A time to tough it out! I presented at a Surrey CC workshop at Denbies for our members given by Garath Symonds (Assistant Director Services for Young people). Cuts of £5 mill from a £16 mill budget must have some adverse consequences, BUT I do think that Garath has done well to mitigate the worst effects and to offer a reshaped service in which the voluntary sector has a considerable opportunity – to deliver wider services from the youth centres that are being opened up to the sector, and to be “on the menu” of the local prevention framework. Elsewhere we are having discussions with Surrey CC about how to increase volunteering, and I am talking to the Chamber of Commerce about other links. I attended a Surrey CC 14-19 Partnership Group yesterday, about the FE sector, which is badly affected by grant cuts and the loss of EMA to young people, and yet the performance of young people is still doing well. Personal disclosure: completed year 2 assignments of MA Theology (just dissertation left for next academic year) and have read my first novel for a year, as opposed to a theology book. Am singing in Chichester Cathedral on Saturday – massed church choirs! FA Cup Final week –end too. Need to get fitter for speed walk with son in late June on the South Downs Way (80 miles for us). A week that has flashed by, and a worry about how to get things done in April when there are so many Bank Holidays and leave taking, including by me, and we have a Trustees/ Directors meeting on 3 May…I know, plan ahead/time management! The week began with the Guildford Diocese’s South East Faith Forum on the subject of the Big Society . This included a quite brilliant speech by Rev. Dr Malcolm Brown (CoE Mission and Partnerships Adviser). He put the BS into a historical context: Jeremy Bentham talking about a society of strangers in the 19thC, and hence the need for State intervention, contrasted with Figgis (1910) writing about society as “a community of communities” smaller than the State but larger than mere individuals and families, and so needing intermediary bodies – churches, trade unions, and universities to sustain and nurture them . He also mentioned Phillip Blondel the political thinker behind Cameron on the BS. As practical examples of the outworking of the vol. sector trying to progress elements of the Big Society, I had a meeting on Thursday with Adult Care service commissioners with our member organisation, Halow about moving a small group of young people out of expensive out county residential care into independent living. Detailed work is now to be done on the costs Surrey CC is incurring from current placements and then to see if there is scope for an initiative funded by social finance. In the afternoon, I had a brilliant meeting about the setting up of the social enterprise to provide employment for young people, which is now going ahead and the company (a CiC) being set up. Massively positive, albeit small scale, and an interesting test bed. Then today a Keeping in Touch meeting with Surrey CC’s Head of Service for Young People, which was also positive for the sector. Personal: Up to London this week end to have dinner out with youngest son, and then to support middle son in running the London Marathon. He wants to get in under 4 hours, and has raised £3,500 for a charity supporting children in India (the railway Children) who sleep on the rail tracks. We had possibly the best ever Celebration of Youth last Saturday evening at an excellent venue - Jubilee High School, Addlestone which has its own theatre. We had a distinguished audience of guests - the Lord Lieutenant, the High Sheriff(s), the Chairman and the Chief Executive of Surrey CC and 9 out of the eleven “Mayors and Chairs” and we had a good audience of parents and friends supporting some great performances by young people, and with loads of exhibition stands. We printed 200 programmes which were all used up. There are pictures of the event on our website and Facebook. In different vein, I met up with the Head of Youth Services for West Sussex CC on Monday evening and she explained that her restructuring had resulted in some 87 redundancies…so this is a tough time for youth workers everywhere. On Tuesday evening, I met with our members from our uniformed organisations; amazingly the Girl Guides in Surrey East have a waiting list of 450 young people to join the Guides- the impediment is the lack of volunteer leaders. I co-presented with the Head of Surrey Youth Service at an important meeting with those of our member organisations working with young offenders about the possibility of deploying social finance (ie from corporates or social philanthropists), recognising that there is a minus 30% in public expenditure and likely to be ever increasing challenges for young people. I confess to being a keen advocate of social finance, and of what I call a new “triangular model “ or relationships between the public sector – voluntary sector – corporates/social philanthropy. The experts on this are the charity called Social Finance, but I have about 20 papers on the subject which will go up on our website in a week or two. It was a good first meeting and the agreement was to meet a second time once work has taken place outside the meeting. I am gradually clearing my decks of completed projects so that I can concentrate on the key task, as for everyone else in the VCFS, of getting in income for 2012/13, but meanwhile, I’m taking the afternoon off to enjoy (and work in) the garden! Really interesting if demanding week…. Last Sunday I did the “Y toY” 26 mile marathon charity walk from Guildford Y to RedhillY, in aid of the work of Redhill Y with children and young people with disabilities. We started at 9.00 am and got in at 6.30 pm which is pretty good going, though the CEO of RedhillY ran it in 4.5 hours! I did not have any blisters or aches, and raised £450 so was pleased, - a big thank you to my sponsors. I then met up with the County Council’s Head for Services to Young People at 8.30 am on Monday morning for a private chat, which has to be...private. I went to the induction session for the new Lord Lieutenant’s cadets, both civil and military on Tuesday evening at County Hall, and was struck by the maturity and assurance of these young people, aged 16-18. Our incorporation as a company has come through this week in the nick of time for our intended 1 April start, so having both this and our Pqasso award we are well placed to present ourselves as a well organized charity that is focused on Innovation and Impact in 2011/12. I went to a late afternoon NCVYS session in London on leadership featuring Charlie Mayfield, the CEO of the John Lewis Partnership. He gave a very interesting talk. Famously the JLP is a mutual founded some 75 years ago and owned by the 75,000 staff. Lots of lessons for banks. I was very impressed by his matter of fact style, and lack of bravado. In different vein, there have been several useful reports from New Philanthropy Capital recently which we’ll put up on our website next week, including one on Preparing for Cuts, which we discussed at yesterday’s Community Foundation, Surrey policy committee. I am constantly arguing that there needs to be a “new settlement” which sees a close triangular relationship between: Central and local government – the voluntary sector- corporates/ social finance/ philanthropists. And tomorrow, Saturday, is our Celebration of Youth and Volunteering, so more about that next week.